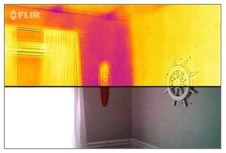 Thermal imaging makes the otherwise invisible world of heat energy visible to your eyes. Everything around you either emits or reflects heat energy. They are a great tool because thermal imaging can see what your eyes can’t. You’ll see hot and cold spots where insulation is missing, identify where air is getting in or out of your house, and more. Check out a thermal imaging camera from the Montgomery County Public Library. The County has purchased 8 Flir cameras that attach to phones.The library has 4 cameras for android phones and 4 for iPhones. 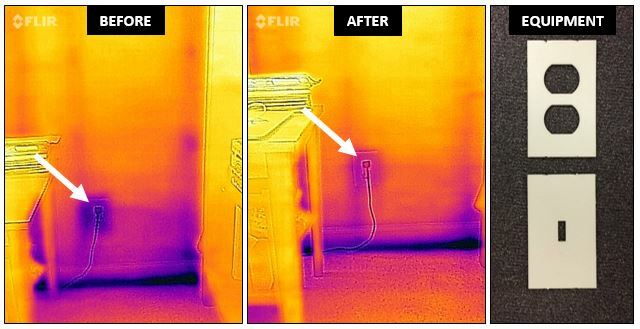 When used with the Flir app, you'll be on your way to finding leaks. When you reserve a camera, the library will send the camera to your local branch for you to pick up and then return. 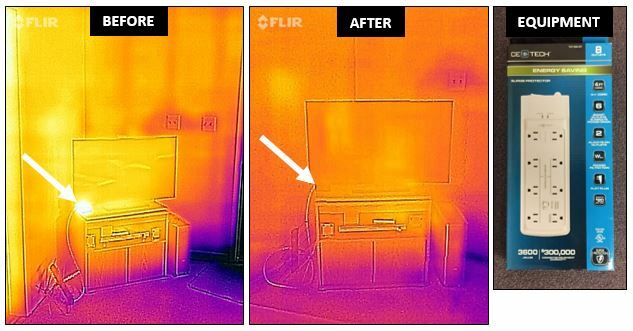 With FLIR ONE, when you look around a room in your home, you can see where doors and windows are not well insulated. You might see a wall switch is slightly warm that could indicate a pending problem or overloaded circuit. The list of uses is long and will grow dramatically as customers discover this unseen portion of the electromagnetic spectrum. Got Your Thermal Camera in Hand? To best identify energy saving opportunities, there should be at least a 20-degree temperature differential between the inside and outside of your home. If possible, use the camera in the morning before your home has had the chance to heat up from the sun. Common culprits for air leaks include doors, windows, exterior outlets, ducts, and connections to the outside such as cables or plumbing fixtures. Areas that might need additional insulation include attics, walls, floors, foundations, crawl spaces, and ducts. Older homes that have not been well maintained can usually benefit the most from air sealing and adding insulation. Air leaks and insulation gaps are also often created during renovations, when contractors are drilling holes or moving insulation around. Examples of short, medium, and long term projects are provided below, but every home and every homeowner is different. Whether you prefer to hire a contractor or do the work yourself is up to you. More information for do-it-yourselfers can be found on the ENERGY STAR website. If you aren’t sure what your results mean, consider hiring a professional to conduct a home energy assessment. Short-term projects use inexpensive equipment that can be found at your local hardware store. Many homeowners will feel comfortable performing these upgrades themselves. 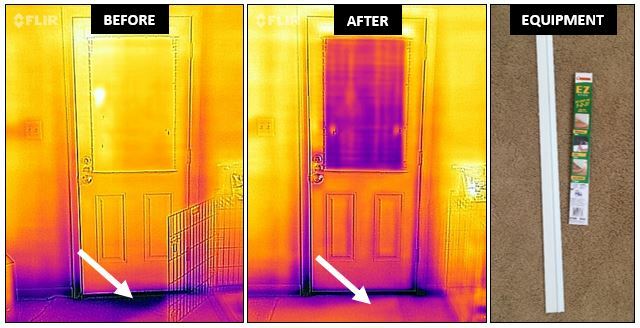 Drafty Door: Drafts often occur under exterior doors. Add door sweeps to both regular and screen doors and check that existing door sweeps are in good condition. Leaky Windows: Even new windows can let air pass through around the edges. Add extra weather stripping along drafty spots, such as the underside of windows that open and close. If a window is drafty along the outside of the frame rather than along the window itself, caulk is needed rather than weatherstripping. Leaky Outlets: Exterior wall electrical outlets are often uninsulated. Block airflow by inserting socket sealers underneath outlet plate covers. For safety, you should always de-energize the circuits serving any outlets you will be working on. Electronics on Standby: Electronics can still use electricity when not being used. Install a smart power strip to stop electricity from flowing to unused devices. Medium-term projects use equipment that typically must be ordered online. Many homeowners will feel comfortable performing these upgrades themselves. Drafty Fireplace: Fireplaces and wood burning stoves are classic areas for heat loss since chimneys need to exhaust smoke while fires are burning. During the summer months when your fireplace is not in use you can temporarily block air flow with a chimney balloon or fireplace plug. Uninsulated Attic Door: Even well-insulated attics can be missing one key component – an insulated attic door. A variety of attic door covers are available depending on the size and type of your door. Long-term projects are often performed by a contractor that specializes in energy auditing or insulation. Many homeowners will not feel comfortable performing this type of renovation themselves. 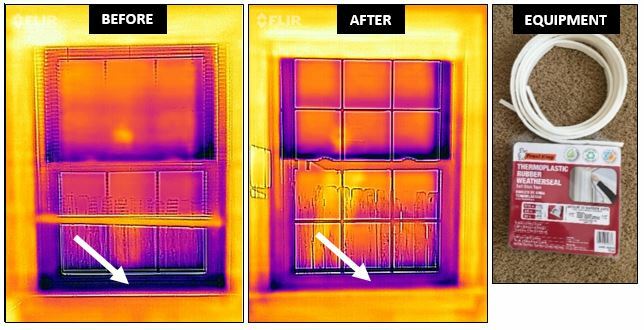 Inadequate Insulation: In the left picture below, missing pockets of insulation are revealed by dark purple spots. If insulation needed to be added everywhere – i.e. the R-value was simply too low – the ceiling would appear more uniformly pink or purple. Insulation often gets moved when installing ceiling fixtures such as recessed lighting. Whenever you place insulation near a hot object such as a light, remember to take safety precautions like using an attic insulation shield to avoid starting a fire. Uninsulated Foundation: As shown in the photo on the right, home foundations are often uninsulated. It is also common to find air leaks between the foundation and the bottom of the house. Uninsulated Crawlspace: Many homes have crawl spaces under one area of the house where an addition has been added. In the left picture below, the yellow portion is located above a finished basement while the purple area is located above a poorly insulated crawlspace. Leaky Duct: The ducts that provide conditioned air throughout your house can also be uninsulated and leaky. The yellow in the picture to the right reveals where a duct is located under the floor. If your ductwork is exposed, you can insulate and seal it yourself, but ducts located under the floor will likely need to be worked on by a professional HVAC technician. Thank you to the Fairfax Energy Action Team for the content and images. These easily fixable problems may be costing you! On average, $200 to $400 per year could be going to waste as a result of drafty doors, windows or other air leaks, according to the U.S. Department of Energy. You don't need to buy a thermal camera! If you have a library card, you could start saving on your monthly cooling and heating bills by following the DIY projects above you have identified with a thermal camera. 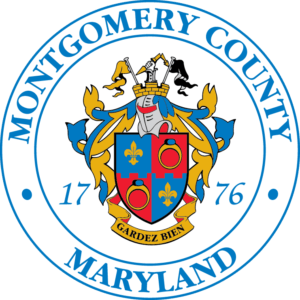 The County offers thermal cameras on loan through the Montgomery County Public Library. These cameras, which attach to your smartphone, allow you to see hot and cold spots in your home that aren’t visible to the naked eye. You’ll be able to see your way to savings by finding air leaks and poor insulation.